Wheel alignment, steering and suspension repairs (often referred to as ‘front end repairs’) can be expensive for some cars. Therefore, it’s more important than ever to find an auto repair shop that’ll provide quality repairs at a fair price. We realize your vehicle was a major investment, and the quality of your auto repair service shouldn’t be left to chance. Choosing the right mechanic in Tempe can be a task. Finding a mechanic that’s trustworthy and honest is an altogether different task! Dependable and honest service is priceless. If you suspect you’re experiencing a challenge with your wheel alignment, steering or suspension, the first thing you need to do is bring your car in for a free inspection and estimate. It could very well be that the problem you face is a simple one. 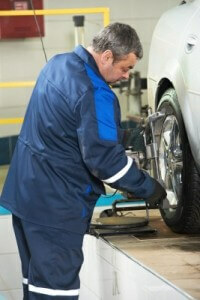 Elite Auto Repair offers quality wheel alignment, steering and suspension work. Free vehicle inspections are always performed for all of our clients. You’ll never experience over-inflated pricing. Come and visit us! We service the Tempe AZ, Chandler AZ and Phoenix AZ areas.